Councillor Davie Paterson at Hawick police station. A Borders police chief has spoken out to defend policing levels in Hawick amid claims that criminals are “rubbing their hands” over reported staff shortages. Chief Inspector Andy McLean has responded to concerns raised by town councillor Davie Paterson that the custody suite at Hawick Police Station is now sometimes closed at weekends and that anyone arrested locally is being taken to Galashiels police station instead. The local area commander for the Borders admitted that, due to staffing issues, the Wilton Hill station is not fully operational at weekends on some occasions. However, he assured Teries there is no permanent weekend closure and that during any such periods, procedures are in place to ensure a sufficient level of policing locally. He said: “I would like to assure the communities of Hawick that the local police station is not closed at weekends. 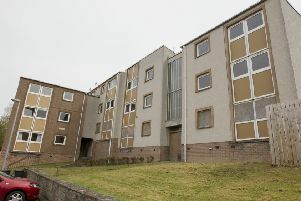 “On occasions, due to staffing issues or operational demand, the custody suite at Hawick police station is not in use, so anyone arrested in the town is taken to Galashiels police station. Mr Paterson, an independent for Hawick and Hermitage, said: “I am concerned about Hawick police station being closed at the weekend and anyone that is lifted by the police having to be taken to Gala or Edinburgh. “If they are having to take someone to Gala or Edinburgh, that is two officers off the street. No wonder some criminals are rubbing their hands. “It has been brought to my attention that recently there were no police officers on duty in Hawick because they had to take people that were charged to either Gala, with two cells, or to Edinburgh because the Hawick station was closed. Fellow Hawick and Hermitage councillor Watson McAteer, a retired divisional police commander and chair man of Scottish Borders Council’s police, fire and rescue and safer communities board, has repeatedly sought assurances over the future of the station. He fears that any long-term reduction to services provided at the station casts doubt over its long-term viability. Mr McAteer said: “I asked this question over the weekend and received an assurance from Inspector Keith Harris that Hawick police station was open for business. “He further advised that for operational reasons the custody facilities were moved to Galashiels to support the Melrose sports. “While I can accept this explanation, I would be alarmed if this was a regular occurrence. “This is one of the reasons why I recently expressed my concerns that none of the Scottish Borders Council-funded community action team are being based at Hawick police station.